I’d seen photos of Mont Saint-Michel before but, if I’m honest, I didn’t know much about this incredible island in Normandy, France. I didn’t know a lot about it other than the fact that it looked like a magical town that would fit perfectly between the pages of Harry Potter novel. It appeared in my Pinterest and Instagram feeds along with hundreds of other awe-inspiring destinations that I longed to see with my own eyes. 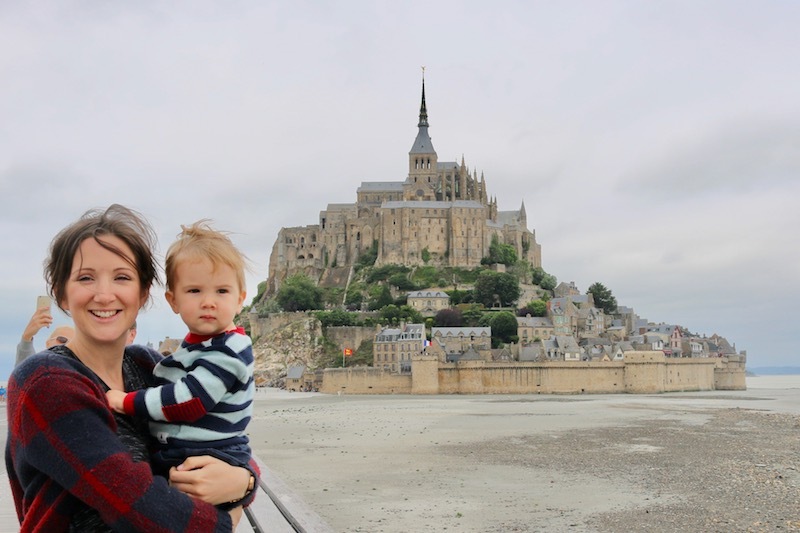 When we were glamping in France with Les Castels we’d been sent the suggestion to visit Mont Saint Michel when travelling between Château de Lez Eaux and Domaine des Ormes. These were two campsites we were staying at as we road tripped around France and Mont Saint Michel was a perfect stop between the two places. 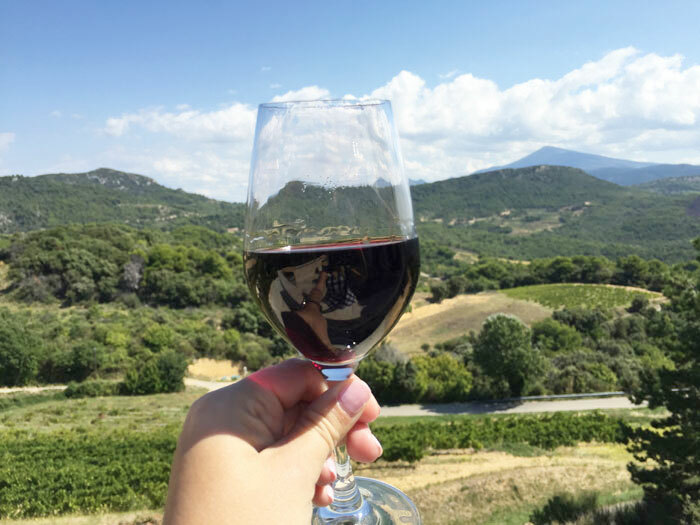 The name ‘Mont Saint Michel’ rang a bell but it wasn’t until we arrived that I realised it was the breath-taking and beautiful UNESCO World Heritage Site. Mont Saint-Michel in France is set on a small island just off the coast where Normandy and Brittany merge. There aren’t many historical sites that trump Mont Saint Michel when it comes to settings! The island’s towering abbey, which dominates the surrounding landscape, is one of the most captivating and recognisable landmarks in the country, and its history and architecture are just as memorable. When visiting Mont Saint Michel you park a little way away from the island and then either catch a quick shuttle bus or walk to Mont Saint Michel. The walk is beautiful as you slowly approach the impressive abbey so I’d definitely recommend walking if your legs are up to it. The shuttle bus is free and is included in the price of parking. Here’s a link to current prices for the carpark. We walked on the way in and took the shuttle on the way back out which is a nice way to do it, especially if you’re travelling with children or people who may not be up to too much walking. 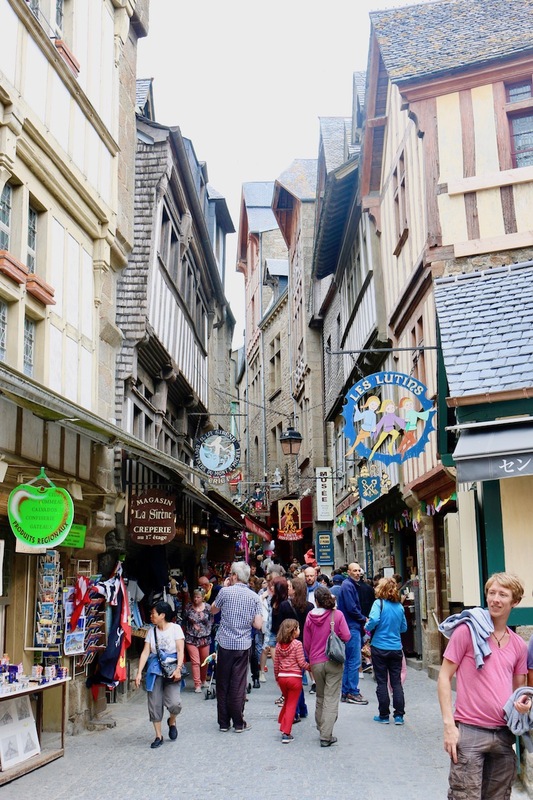 Because that’s exactly what it feels like, it’s like walking through Hogsmeade thanks to the otherworldly charm of Mont Saint Michel . Keep walking and after a lot of steep steps and climbing you’ll come to the abbey. You have to pay to get into the abbey but it’s worth every penny, it is stunning! The history and beginnings of the abbey are shrouded in legend, leading to its position of a significant place of Christian pilgrimage and worship. The story goes that the Archangel Michael visited the bishop of a nearby town and instructed him to build a church on the island, and you don’t exactly ignore an angel. From 966 AD the church was developed into a Benedictine abbey, evolving across the subsequent centuries, particularly in the medieval times when several awe-inspiring monastic buildings were added to the complex. 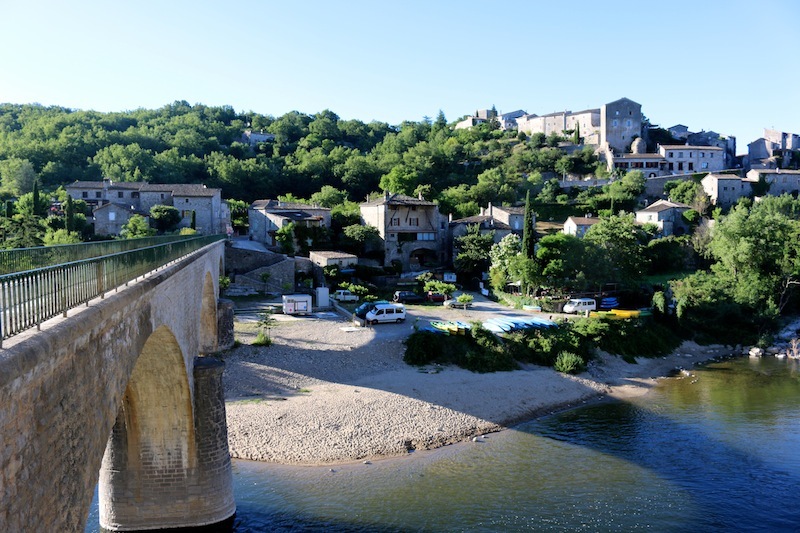 The island became a famous centre of learning, welcoming some of the greatest minds across Europe, while simultaneously keeping out the royals from across the channel who could never breach the ramparts, which, ironically, now open to around three million tourists every year. Many of the fine buildings which went up along the streets of Mont Saint Michel have been converted into boutique shops, crêperies, hotels and museums, though they still retain their old charm. 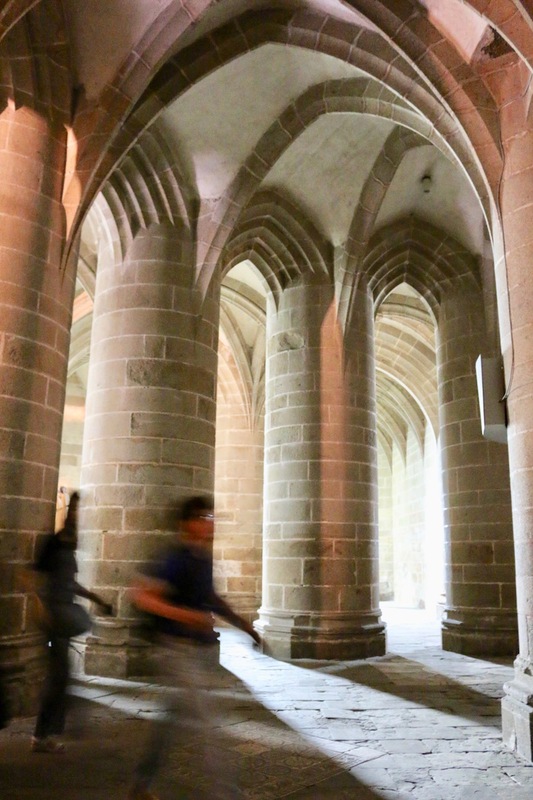 You can’t visit the island without taking time to explore the Abbey of Mont Saint Michel. The abbey is open to explore all year apart from 1st January, 1st May and 25th December. You can take a one-hour guided tour to get the full story behind the beautiful medieval architecture and the abbey’s ever-changing role through time. We didn’t do this as we were travelling with George who was a baby at the time, but I wish we had as you don’t get the full impact of the abbey just by wandering around. For magnificent views across the mudflats and along the coast, as well as some respite from the tourist crowds, take a walk along the Ramparts of the abbey. The Porte Eschaugette to the left of the main gate is the easiest and quietest route up, and make sure you get your camera ready for the vistas enjoyed from Terrasse de l’Ouest. 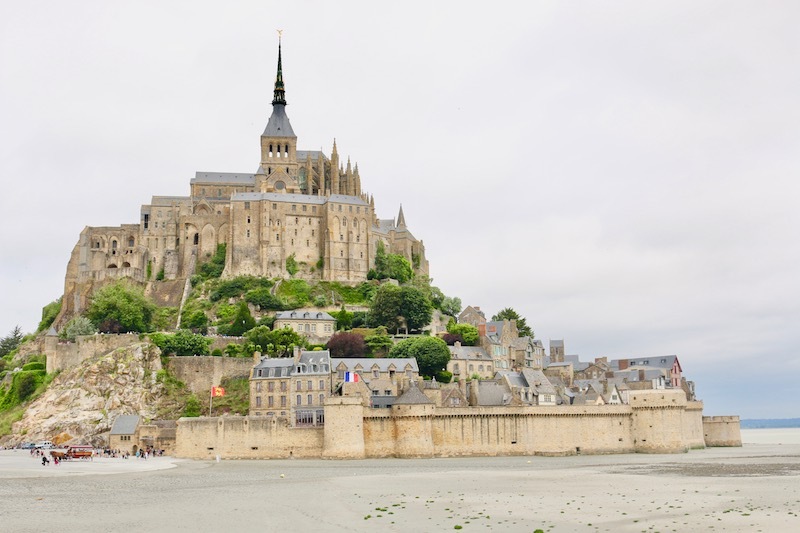 You’ll have a range of museums to choose from throughout Mont Saint Michel, but if you have to settle with just one or two, make sure you visit the Museum of History and the Maritime and Ecology Museum. The former showcases various old collections such as weapons and paintings, while the latter provides a great insight into the tides, bay and maritime identity of the island and its surroundings. Mont Saint Michel is famous for crêpes and omelettes and there are plenty of restaurants to choose from. If you’re after an omelette, you simply have to visit La Mere Poulard. This restaurant is world-famous, cooking up delicious and innovative omelettes, but be warned, it can get busy here, though it is possible to make a reservation. Crêpes are the next best thing, and you won’t have a shortage of crêperies to choose from. Tucked away off the narrow Grand Rue is Crêperie La cloche, arguably serving up the best crêpes on the island, though others claim they are among the best in France! If it’s a big hearty meal you’re really after, you can’t go wrong with a visit to Le Relais du Roy, dishing up delicious meat and seafood to the south of the island. If you’re on a budget or you don’t want to tackle the crowds then I’d recommend preparing a picnic for your trip. There are plenty of benches and a few quiet spaces where you’ll be able to enjoy your packed lunch in peace. With its location on the border of Brittany and Normandy, Mont Saint Michel is an ideal base for exploring some more highlights and attractions in the area. The closest and most obvious day trip to make is to the town of St Malo. Founded in the 12th century, St Malo is famous for its ramparts and forts, of which the former is fantastic to traverse, offering immense views of the numerous forts built on the islands around the bay. While I was in St Malo I visited Saint-Cast-le-Guildo which was an absolutely gorgeous seaside town. The next port of call should be Dinan, located to the south-west of Mont Saint Michel and arguably the most beautiful town in Brittany. The pretty architecture, charming streets and the oldest ramparts in Brittany are well worth a day or two of exploring on foot, while the likes of the Basilica of Saint Sauveur provides one of many party pieces. I’ve got a mini guide to Dinan on the blog too! Finally, if you have your own set of wheels, spend a day in Rennes, the capital of Brittany. The city’s most alluring attraction is its old town centre, with its stunning half-timbered houses and atmospheric streets. You could spend an entire day strolling around and absorbing the architecture and landmarks, although if you arrive in the city on a Saturday, you may want to allocate time to perusing the city’s famous Saturday morning market, the second largest market in the country. 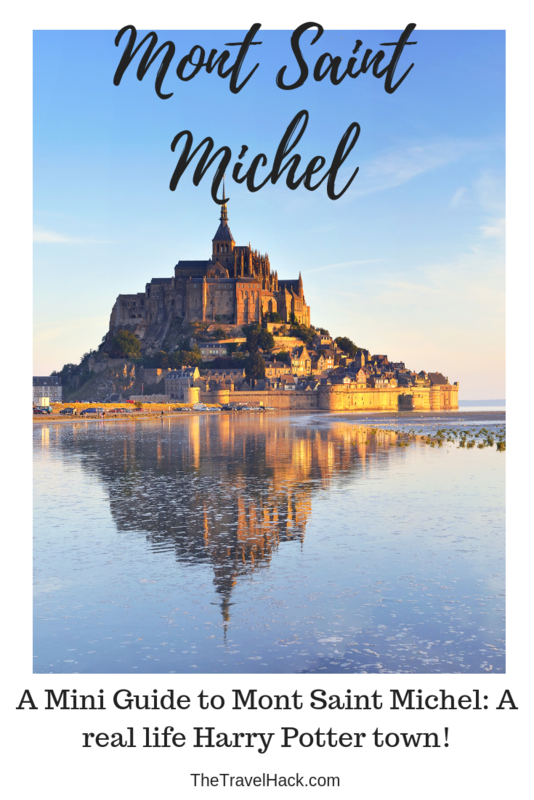 That’s my guide to Mont Saint Michel, a place I definitely recommend adding to your bucket list. This post was originally posted in 2017 and was updated in 2019. Thanks for reading. If you enjoyed this post please do subscribe to my newsletter below for weekly updates. Oh, wow! it really is beautiful, Monica! I’ve never been anywhere close to Mont Saint Michel, it’s good to know about it! I can see where you got the Harry Potter resemblance 😀 I love those kind of narrow, ancient-looking streets. Thank you for writing on it! 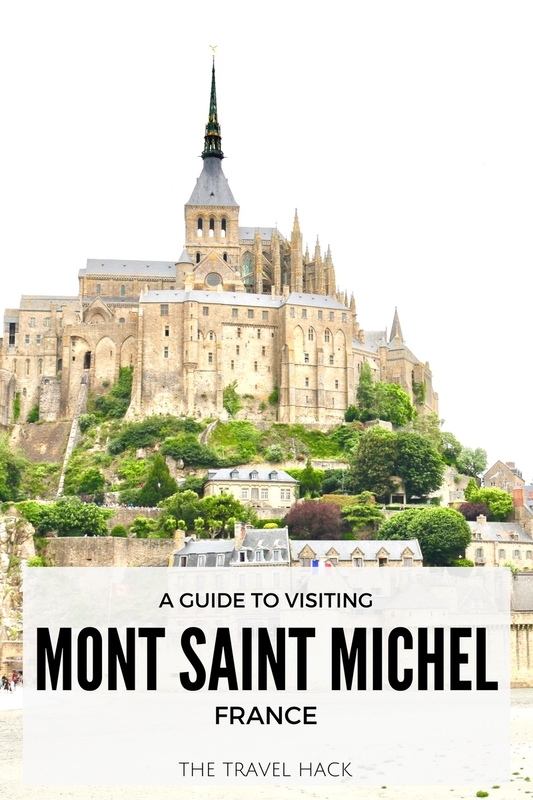 This is such a wonderful, comprehensive guide to Mont Saint Michel! Thank-you so much for this! I haven’t ever been but I can safely say it’s going on my bucket list! It looks like such a gorgeous place! I have always wanted to go there! We had a tour there booked but they cancelled on me at the last minute. Oh well, next time! Excellent post! We also were mesmerized about how Potterish Mont Saint Michel looks. Checking it at night with all the lights reminded us the scene when Harry gets to Hogwarts for the first time. Hope it’s still the same! Actually, just recalled this installation in the Abbey on Mont Saint-Michel when I visited too. Couldn’t be more Potter-like if it tried!